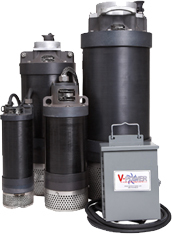 ..:: Welcome to V-Power Euipments, inc ::..
V-Power slimline submersible top discharge dewatering pumps are designed for small diameter well casings and other hard to reach applications. They excel in tight places where other types of pumps are unsuitable, and their light weight makes them extremely easy to maneuver and install. Designed for durability, V-Power dewatering pumps are constructed of robust hard anodized aluminum with stainless steel hardware. Abrasive resistant stainless steel impellers (2hp to 50hp) stand up to sand, gravel and other harsh materials while the stainless steel strainer prevents large particles from entering the pump. With double mechanical seals, upper seal spiral lubricator, vacuum pressure impregnation motor windings, and epoxy potted power cords, V-Power pumps are designed and manufactured to minimize downtime while maximizing reliability and service life. V-Power pump parts are also interchangeable with those on the Prosser® pumps you may already have installed. Whether you are looking to install a new dewatering pump, or repair or replace an existing pump, the V-Power line has the high-quality pumps and replacement aftermarket pump parts you need to get your job done on time, and on budget. If you need to remove unwanted water, there's a V-Power high head portable pump that can do the job. 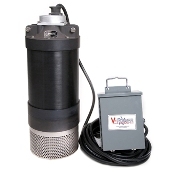 V-Power portable submersible pumps are the most cost-effective choice for efficient, reliable dewatering. More than 100 high head and high volume models are available. V-Power pumps feature slimline design to fit in the smallest areas. You can also include such optional extra features as watertight control enclosures, liquid level controls, adapter kits, and more. This wide range of choices enables you to select the exact pump you need to fit your particular application. V01012 3/4 3450 1/230 41 100 2"
V01032 3/4 3450 3/230 41 100 2"
V01034 3/4 3450 3/460 41 100 2"
V01311SC 1 3450 1/115 46 120 2"
V01311 1 3450 1/115 46 120 2"
V01312 1 3450 1/230 46 120 2"
V01332 1 3450 3/230 46 120 2"
V01334 1 3450 3/460 46 120 2"
V20111 2 3450 1/115 76 175 2"
V20112 2 3450 1/230 76 175 2"
V25132HH 2-1/2 3450 3/230 89 152 2"
V25134HH 2-1/2 3450 3/460 89 152 2"
V27112 2-3/4 3450 1/230 50 300 3"
V35112 3-1/2 3450 1/230 78 250 3"
V50112 5 3450 1/230 91 300 3"
V501322ST 5 3450 3/230 175 185 3"
V501342ST 5 3450 3/460 175 185 3"
V60112 6 3450 1/230 80 450 4"
V60132 6 3450 3/230 80 450 4"
V60134 6 3450 3/460 80 450 4"
V81032HH 10 3450 3/230 165 450 4"
V81034HH 10 3450 3/460 165 450 4"
V81532HH 15 3450 3/230 200 600 4"
V81534HH 15 3450 3/460 200 600 4"
V82532HH 25 3450 3/230 230 800 6"
V82534HH 25 3450 3/460 230 800 6"
V85034HH 50 3450 3/460 245 1025 6"
If you need to remove unwanted water, there's a V-Power high volume portable pump that can do the job. 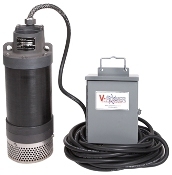 V-Power portable submersible pumps are the most cost-effective choice for efficient, reliable dewatering. More than 100 high head and high volume models are available. V-Power pumps feature slimline design to fit in the smallest areas. You can also include such optional extra features as watertight control enclosures, liquid level controls, adapter kits, and more. This wide range of choices enables you to select the exact pump you need to fit your particular application. V01011 3/4 3450 1/115 41 100 2"
V25132HV 2-1/2 3450 3/230 50 300 2"
V25134HV 2-1/2 3450 3/460 50 300 2"
V27112 2-3/4 3450 1/230 50 300 2"
V35132 3-1/2 3450 3/230 78 250 3"
V35134 3-1/2 3450 3/460 78 250 3"
V50132HV 5 3450 3/230 91 300 3"
V50134HV 5 3450 3/460 91 300 3"
V81032HV 10 3450 3/230 104 605 4"
V81034HV 10 3450 3/460 104 605 4"
V81532HV 15 3450 3/230 130 800 4"
V81534HV 15 3450 3/460 130 800 4"
V82532HV 25 3450 3/230 160 1000 6"
V82534HV 25 3450 3/460 160 1000 6"
V85034HV 50 3450 3/460 190 1425 6"